As a committed animal lover with years of experience in training horses and owning many dogs, I can say that yes, there will be changes as you welcome your first child home, but they will most likely not involve any extreme loss in the relationship between you and your pets. Having pets in your home while raising a child can actually be beneficial. 39 percent of households in the U.S. have at least one dog (American Pet Products Association, 2011-2012), and studies have shown that children who grow up with dogs and/or cats have lower incidences of allergies and stronger immune systems (Health.com, 2011), as well as a higher aptitude of understanding and empathy. Family dogs welcome newborns into their homes and accept them as a new family members every day all over the world. Trust me, they are not fretting over those first few days and weeks like you will be! Many family pets will make their own adjustments without your help, but of course, you shouldn’t assume yours will. 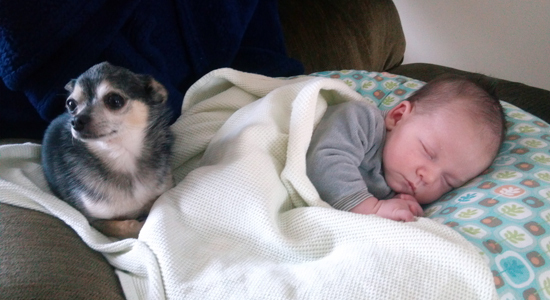 Our Chihuahua, Diesel, (pictured above with my second son when he was four weeks old) only weighs five pounds, but we underestimated his Napoleon complex! When people would come over to visit our firstborn, he would stake his claim over my lap and the baby, and try to attack anyone who came near us. Fortunately, he was all bark and no bite, and at first it was flattering that he felt so protective, but after a couple of incidents, we knew we had to intervene. Our solution was to put him in his crate when people visited (he loves his crate, so it was a quiet sanctuary, not a punishment). Then we slowly included him in visits with family and friends, but we did not allow him on the couch or near our laps. He finally got over it. Now with our second son, lap time with the baby is a special privilege that we have a certain time for. Diesel knows the routine is happy to comply. Always remember that you know your dog’s unique behaviors best, so listen to you instincts. There are few perfect dogs out there. They each have little personality quirks that make them who they are. Some of these are cute and harmless (like an obsession with carrying around a chewed-up stuffed animal), but some could cause trouble when you bring your little one home (like habitually crawling into your lap every time you sit on the sofa). Observe your family’s daily care routine involving your dog and imagine how it will include your baby. Ask yourself, “If I am holding an infant, how will this work safely?” Will your dog have access to your baby’s bassinet, play yard or lounger? If you aren’t watching for a moment, do you worry that your dog’s curiosity will encourage him or her to make contact with the baby? Help your dog make gradual changes before your newborn arrives, and stay fully committed to them. Do not wait until after your baby is home to suddenly make a new rule like your dog is not allowed on the sofa anymore. Make one or two changes at a time, and allow at least a month to establish the new norm. If you are unsure of how to retrain your dog yourself, contact a local dog trainer for help. Be consistent and follow through so that your dog feels safe and secure. Get your dog used to new sounds and objects that will be coming into your home with your baby. Preparingfido.com sells audio CDs and MP3 downloads with 45 minutes of baby sounds that you can play for your pet. These are good for dogs that are especially sound-reactive. Expose your dog to baby toys and equipment too, especially those that make noise, light up or vibrate. Make it a positive experience with treats, pets and praise. Speaking of baby equipment, baby gates can be doggy gates too! Use them to set up dog-free zones. Since we had our first baby, we’ve used gates to keep our dogs in one area of the house while we’re in another. Of course, we all stay together sometimes too, but having control to allow for separation at times has been beneficial for everyone. Our dogs seem to appreciate kid-free time in their crates or baby-gated rooms. Practice holding a baby in front of your dog. Wrap a life-size baby doll up in a baby blanket that you plan on using and interact with it. You could even play baby sounds (see No. 4) while you do this. Walk around to different rooms in your home and practice all the situations you can think of in order to establish space boundaries between you and your baby and the dog. This will prevent your dog from jumping, weaving in and out of your legs and being nosy when you’re holding your real baby. Address severe behaviors as soon as possible, and remember that your baby comes first. Your love for your dog may be strong, but the safety and well-being of your child is more important. If your dog demonstrates any aggressive or overly reactive behaviors that could threaten your baby, call a professional dog trainer or behaviorist for help. If the situation cannot be reversed, allow enough time to rehome your pet before your baby arrives. Putting effort into preparing your dog for the arrival of your newborn several weeks or months in advance will allow for the homecoming of your new little one to be pleasant for you, your baby and your pet. The less you have to worry about the first few weeks, the better! Pets appreciate being included with new family members, and in the long run, they benefit the most from your leadership, love, and predictable direction. Kristin and her family, husband John, six year old Johnny, and their new recent addition baby Joey, live on a small farm near Doswell, Virginia. She has a love for nature, animals, and teaching children how to ride horses and connect with animals. She encourages her family to embrace the outdoors to help balance out an increasingly technological world. Anything more simple, natural, and down to earth is always of interest for her to investigate when it comes to the over all health of her family.